Rafael Nadal could return from a hip injury next week after being named in Spain’s Davis Cup squad. Nadal, 31, has not played competitively since pulling out of his Australian Open quarter-final against Marin Cilic in January. He had planned to play in last month’s Acapulco Open before withdrawing, and then pulled out of the ATP Masters events in Indian Wells and Miami. 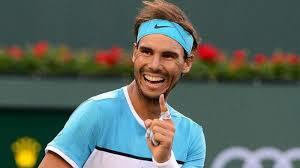 “Rafa is getting better and training more,” captain Sergi Bruguera said. Despite not playing since January, Nadal will return to action as the world number one after Roger Federer was beaten in the Miami Open second round this week. Spain, who knocked Great Britain out of the competition last month, host Germany on Nadal’s favoured clay in Valencia from 6-8 April. Roberto Bautista Agut, Pablo Carreno Busta, Feliciano Lopez and David Ferrer have also been named in the team by Bruguera.